My work is a culmination of my experiences in nature and interest in industrialization and agriculture. Issues dealing with environmental and personal concerns dominate the content and aesthetics of my work. The action of making work in itself is a process of discovery for me. I make work that attempts to be open-ended in its interpretation. I strive to create dialogue, or conjure a memory, or simply for one to find beauty in the object. Every piece has multiple inspirations as well as multiple meanings to me depending on time and place and interaction with the work. I strive for others to see the work in the same way. I inevitably have a memorable experience every time I am outdoors, some not as fanciful as others, but I am always amazed and inspired. I have ridden a motorcycle alongside two bull elk on the forest roads of the White Mountains. I have been kayaking on mountain lakes where the fog is so thick I did not know where the shore was. I have nearly been swept away while fly-fishing in the middle of the Colorado River when the floodgates were opened upstream. Adventures such as these coupled with day-to-day life inevitably find a way into all my work. 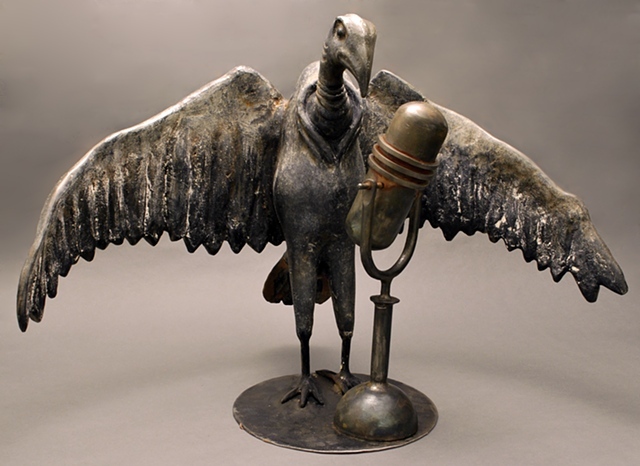 I create whimsical sculpture using woodworking, foundry and fabrication skills in conjunction with found objects. My sculpture typically addresses in some way or another the delicate balance between nature and industry. I am particularly interested in the ways that man once found answers in nature and how we now turn to technology to solve our problems. I am fascinated with how these changes are affecting issues such as agriculture, water rights, global warming, etc. Art is a process for me to find my place in the world and address concerns for my future existence.